I must admit that at first, I was passive about this body tool. What can it do? As we strive in aiming to have that soft and silky skin, we knew that shortcuts are not an option. We exercise, eat the right food and we take dietary supplements. 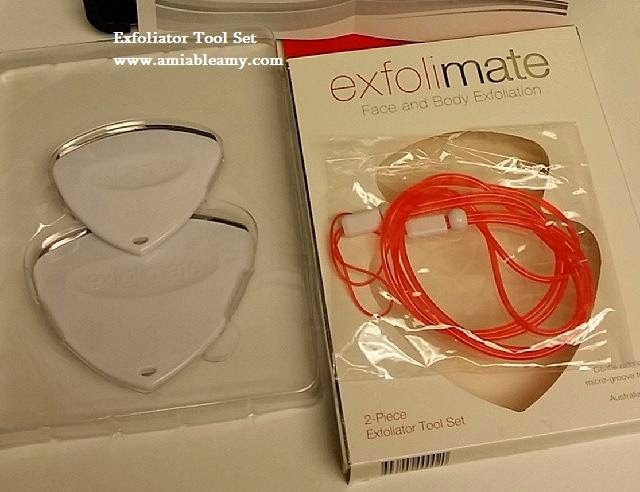 We also buy body tools that will help exfoliate our tired skin just like this face and body exfoliation set from Exfolimate. This product is designed in Australia and that's probably the reason why I haven't seen or heart about this stuff. This face and body exfoliation set includes 2 pieces of exfoliator tools, one for the body and one for the delicate skin, the face. As you can see on the photo above, the packaging is beautiful. It includes the tool set and the orange wrist straps as well as the direction/guide on how to safely use the tool. I advice you that if you buy this tool, you should read the direction first before your first try. I like the fact that this tool instantly exfoliate and clarify the pores without scrubbing my skin. As I was using it, there is a sensation as if it massages my skin and gently released the dirt and oils stuck in the pores of my skin. It’s as if the blood in my veins circulates well every time I run the smooth metal edge on my skin. After the shower, my skin felt relax and fresh. Using this product in the shower daily probably will improve the tone and texture of the skin.